Welcome back to Jon, who wrote this great Guide to Supporting New Dads. He and his wife Jannine have been married for 14 years, and are currently the pastoral care directors of Living Well Church in Rotorua. My child doesn’t seem to like me very much at the moment, and I can’t quite understand why. My plan was always to be a ‘hands on’ dad, and I have the privilege to work in an incredibly flexible, and supporting work environment. So, when our girls were born (we have two: Caitlin is 3 ½ and Isobella has just turned 1), I was there, I was available and I was involved. Before daughter #2, daughter #1 was very routined, and for us that worked. At the end of the day, after dinner time, came bath time and bed time, and those were my times, those were daddy daughter times. They were my times to foster and develop an intimacy with my daughter, and I loved that, and I guarded that. The times when this delicious little bundle in her pink flannel pyjamas, hair still wet from the bath, smelling of baby shampoo and baby powder, climbed into my lap and asked for a story or a song, are written on my heart. Leading up to the birth of daughter #2, both my wife and I assumed our normal night time routine would continue the way it was going. But a few weeks before daughter #2, we noticed a shift. My wife was heavily pregnant, and managing a large conference, so not at home very often, and one night, my world changed. The bath was run, everything was ready, and this little voice said “I want mummy to do it”. The first night, that was ok, normal almost, mummy had been really busy, not very active in her current stage of pregnancy, and so child #1 was looking for some quality time with her mother. That was ok, the first night. The second night, same routine, dinner time, bath time, there were tears, “I want mummy to do it”. The third night, it started to get personal. Same routine, dinner time, bath time, but this beautiful little bundle screamed and kicked her heels and wailed – not just tears, not just crying, but wailing, mouth open, tears running down her face, and more noise than I thought could come from something so small. After almost 2 years of baby baths, and bed times, and stories and songs, hugs, and cuddles, and small child noises as she nuzzled into my lap, with her head buried in my neck, suddenly my time was over. On that third night, my heart broke. And it was easy then, to respond out of my own feelings of rejection, and insecurity, and deliver the writhing, screaming mess into the arms of my wife and say, “here, she doesn’t want me, you do it”, and that was just what I did, and have continued to do from time to time, over the last few months. And although I will occasionally succumb to bouts of melancholy, and despair over the lost intimacy with my little girl, I am still a hands on parent. Partly because my parenting will not be dictated by a 3 year old, partly, because it is season, but mostly because whatever is happening to cause this, is something that I need to help her move though. It is not my issue, and as such, it is not my responsibility to change or to fix, it is my responsibility to help and to facilitate her to change and fix those things in her life. And we need to start there. If you are a parent who is feeling rejected by your child, you need to understand that something is happening in your child’s world that is causing them to behave this way. Something that in their world, even though they may not be able to identify or articulate the problem, is very big and very real. For daughter #1, the fact that she didn’t get to see her mother very often, and when she did see her, it wasn’t running and jumping and moving fast like she was used to, and the uncertainty of the impending arrival of a new baby: she was unsettled. Because she was unsettled, she became anxious, and because she was anxious, that manifested itself in what we could call behavioural problems. And although we would all dearly love to fix the symptoms of the problem – make our kids stop fussing at bedtime, say – we need to help our child resolve the problem in their world that is causing them to behave this way. I don’t have the answers. I need to be fairly up front about that. But this post is not about fixing the relational problem with your child. I would love to have fixed this. And if I could, I would have already, but this post is about helping the rejected parent through this phase of only wanting mummy, or daddy. This post is about helping you, when you feel like nothing you can do or say is right, when you feel like you are unwanted, unappreciated, or unloved. I have learnt a few things this year, things that have helped me to (internally) cope, things that I am trying to put in to place to help me work though the phase that we are in. 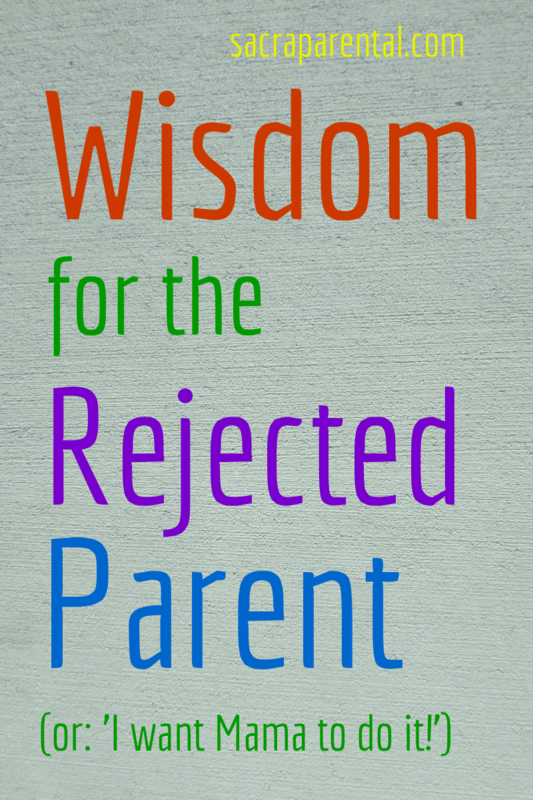 It is hard to feel like the rejected parent, and it is hard to not allow that feeling of rejection to affect your relationship with your children. Hopefully these things will help. “I don’t know what happened”, “it all just changed”, “suddenly it was different”, “someone swapped my child”: these are a few things I have heard in the discussions that I have with friends and parishioners. Something happened, and the relationship you had with your child changed. Now, presuming, of course, that you haven’t done or said anything to invoke this response from your child, please understand that it is their thing, it is their issue. Not yours. And although you may be able to do things to aid and facilitate them working through this issue, most of the time, it just takes time. Be patient with them, and remember that, often, it isn’t about them not wanting you, it is about them wanting someone else. In our situation, it wasn’t about daughter #1 not wanting me, it was about her wanting her mother more. Don’t take it personally, don’t respond in kind and slam doors and stamp your feet and yell and declare that you will have nothing to do with your offspring. Take a breath. Allow them a little bit of space. They are trying to express feelings that they are not ready or able to identify yet. Be patient with them. Give them the space and tools and resources they need to resolve their feelings. If you want to remain close to your children during this period, don’t let them push you away. They still need you, even if they don’t want you in this season; they still need you in their lives. Find every opportunity to connect with them, give them a cuddle when you haven’t seen them for a while, ask them how their day was, eat the family meal together, if you are the one that picks them up from kindy or school, pick them up. Keep doing the things that you do, talk to them the same as you did, treat them the same as you use to. If you didn’t give them rewards or treats for stuff before this happened, don’t do it now. Often we feel like bribing them will work, and it will, in the short term, but in the long term, for the health and wellbeing of your relationship, that will only make things worse. More than anything, focus on the relationship with your child, not the discipline of your child. As hard as it is, when your child pushes you away, when they won’t let you hold them or even come near them, they still need to know that they’re wanted, and accepted, and loveable. They need to know that they are still cared for. And lastly, don’t take it personally. Remember that it isn’t about you. The chances are you are not being punished, so don’t respond from a place of hurt, or frustration, or anger. In the parent/child relationship, you, the parent, are the one that moderates the emotional health of you home. Our children are small, and young and vulnerable, and confused, and conflicted, but our children need us to validate them, to honour them, and to love them. Those things are hard to do when we are on the back foot, when we are the ones feeling rejected, or despised, or hated, but in those times, it is so important to remain calm, to be the mature grown up. Because after all, it will change. It is a season, and it will change. Remember that it is our job, within this season, not to fix the problem, but to maintain the relationship, as much as we are able, so that when your child comes through this phase, and you are the one that they want, your relationship is such that it picks up, where it was put on hold. You don’t have to repair it, or rebuild it.